Somehow I managed to miss this video when it first posted back in March  of a neodymium iron boride magnet being surrounded by Silly Putty filled with iron oxide particles. I see a couple of items worth commenting on. First, this all occurs on a less-than-smooth surface. That allows the magnet to rotate into the magnetorheological material, further giving the impression that the grey matter is alive and intentionally swallowing the magnet. But secondly, I am fascinated by how the FeO2/Dow Corning 3179 Dilatant Compound composite sticks to the surface of the magnet and doesn't really flow over it. Look at the video starting at about 10 seconds where the bottom of the goop is starting to rise up. It rises up, but in a rotating fashion, indicating that there are strong levels of adhesion at the surface of the magnet that is preventing it from flowing upwards along the surface. Where ever a given volume of material first makes contact with the magnet, that is where it will stay. Silly Putty by itself has very little tackiness and adding inorganic fillers will do nothing to change that, so the adhesion is a direct result of the strength of the magnet and the ability of the iron oxide particles to stress the Silly Putty. 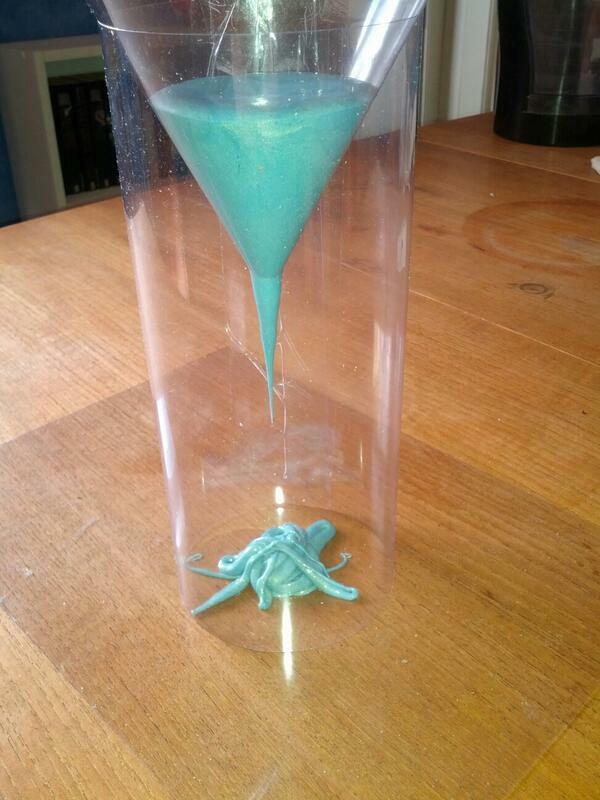 The Silly Putty by itself is not attracted to the magnet, only the particles in the putty. The iron oxide particles, without being covalently bonded to the polymer, are able to apply enough stress to the Silly Putty to get it to move it along with them. This is a fine balancing act. If the force tries to move the putty too quickly, the putty won't be able to relax and little or no fluid motion will occur. It is only by allowing the entanglements in the putty to slip past one another (a slow process) that fluid motion occurs, and this motion will only occur at low stress rates. So while this demonstration works with these small permanent magnets, the results would be far less interesting for a strong electromagnet or possibly if high levels of iron oxide were mixed in. 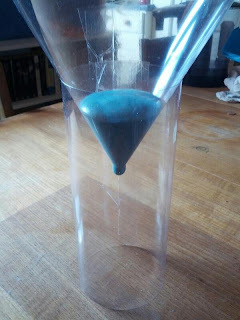 But the greatest part of the balancing act is that the strong attraction between the iron oxide particles and the magnet is enough to get the Silly Putty to flow towards the magnet, but then stop flowing once it makes contact with it. I wonder over the range of concentrations over which this could occur. Kinda neat how that opening gives you the impression that I am more in the loop on these kind of things than I actually am. Leave the putty around the magnet for a long enough time and all the iron oxide would end up at the surface of the magnet and the remainder of the putty would have returned to its original color. Start by imaging a "perfect" crystal of polypropylene, say a fiber that is several centimeters long. Perfection in this case, is clearly unattainable. Perfection would require that the fiber be made up of molecules of polypropylene that are as long as the fiber itself. Not only is such a large polymer unattainable at present [*], but it is even more impossible at present to make all the polymer chains the exact same length (with no branching). To then orient each and every single chain perfectly, line them all up perfectly and then place it in the crystal lattice is really beyond all hope. And since this is my ultimate wish list for Santa, can I have 100% steroregularity too? So in the real world, all polypropylene crystals have defects. Since the molecules are not long enough to span the entire fiber length, there are end defects where one chain ends and another chains starts. The existence of a distribution of molecular weights also contributes to chain end defects. Our inability to create full orientation of the chains introduces numerous defects, namely chain-folded crystals, where the molecule is folded back-and-forth many times in a crystal. Since this fold length is less than the length of the fully extended polymer, it is possible that one part of the polymer chain can extend into another crystal entirely. And then there are packing defects from numerous sources. Since the viscosity of the polymer is so high, that can limit its ability to get into the lattice in the time needed. Or packing defects can arise from branch points. As well as from losses in stereoregularity. So while the perfect crystal initially described would a 100% crystalline material, polypropylene in the real world is lucky to reach more than about 60% crystallinity without special processing. The balance of the material are parts of chains that are caught out, unable to line up and crystallize with other chain fragments in their immediate vicinity. All of this is prelude to tomorrow's the next post about recent research in polypropylene and the "defects" that exist in it. [*] A C-C bond is about 1.54 Å long, and there is about a 110 degree angle between one bond and the next. With that geometry, each C-C bond has a spans about 1.26 Å of length. A 12.6 cm long fiber would be made up of 107 monomers for a MW of 420,000,000 g/mole - about 500 times larger than what we can currently make. And this is just for a short span of fiber. Imagine a 50 meter rope! Assuming I did the math correctly, there is still one flaw with geometry presented here, one that is present in polypropylene but not in polyethylene. Anyone care to comment on the little "spin" I should impose here? As I've said many times before, plastic waste has no business being in the ocean, so dispose of it properly. I've written in the past of not wanting to work with urushiol as a monomer, despite it be biobased and producing some incredibly beautiful lacquers. It's just that the whole idea of working with the active allergen from poison ivy gets my skin crawling (pun intended). I'm adding another monomer to the list, or more correctly, a polymer made from such monomers. Angewandte Chemie has a short review in it's latest issue entitled "Growing Cantenated Nitrogen Atom Chains". These are (blessedly) short chains with an all nitrogen backbone. So far, the best efforts have only reached 11 nitrogen atoms, so it is still too short to call a polymer [*]. The N11 compound shown is actually too unstable to exist on its own and it must be cocrystallized for further handling. The reason is that all that nitrogen is just waiting to return to the N2 from which it originally came and it will give off lots of energy (~ 1500 kJ/mol !) in the process. So not only do you have a large volume change associated with the solid polymer degenerating to a gas, but you also have heat to further energize it. Whether this occurs as an explosion or a deflagration, I really don't care as I'm not going to be anywhere near it. If someone else is interested enough to make these polymers, go for it. You won't have much competition. And if you're not careful, you won't have much left of your fingers either. [*] My operation definition of a polymer is a chain long enough that the addition of one more monomer does not change the properties of the material. This is truly operationally defined as depending on what properties you are examining, that length may vary. Inspired by the infamous Queensland Pitch Drop Experiment and the Johnny-come-lately Pitch Drop experiment at Trinity University, Andy Gibson (@Lopek) created his own version of the experiments using Silly Putty, and then tweeting about it. The result has been put together in Storify and it is pretty interesting to look at. Here are my comments on what is occurring as the experiment proceeds. Rheologically, of course. First off, I am not commenting on every single picture available, just certain key elements. Also, note that the geometry chosen has a major influence over what you see. If the funnel was higher off the desk, the results could vary. The same goes for the diameter of the outlet (more about that specifically in a minute), the slope of the funnel and the amount of Silly Putty used. Temperature would also affect the results, but I'll leave that topic for another day (if ever!). Change any of these and you could generate completely different images. There is another geometric variable that would be interesting to see sometime too, but I'm not going to mention it now. I'll try and set up the experiment myself and then expand on that topic. Pictures 1 shows the "droplet" forming. The bottom of the Silly Putty is round because of surface tension. It takes energy to enlarge a liquid surface and since a round surface has the minimal surface area, the bottom of the Silly Putty is round. 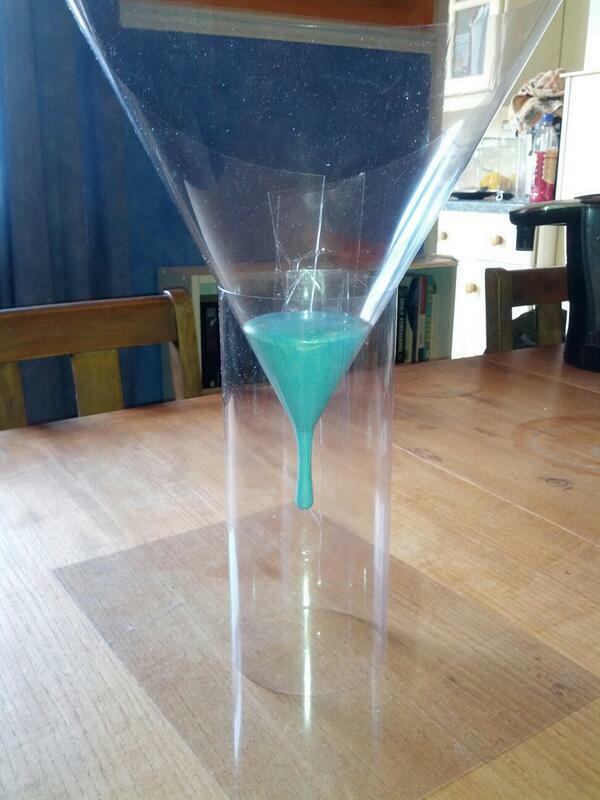 Picture 2 shows that the droplet is extending itself. Because the silicone chains in the Silly Putty are entangled, it is difficult for them to disentangle and allow for a droplet to break off, unlike what happens with Newtonian fluids such as water. The cross-section of the drop is still round because of surface tension, not just because the opening of the funnel is round. Picture 3 shows that the funnel is starting to fall apart slightly and it is claimed by the photographer to not make a big difference. Hogwash. For flow in a pipe, the flow rate (at a given pressure) is proportional to the fourth power of the diameter. A 2 inch pipe carries 16x as much water as a 1 inch pipe. Even a 10% increase in the diameter will lead to nearly a 50% increase in flow. And that's just for shearing Newtonian fluids. 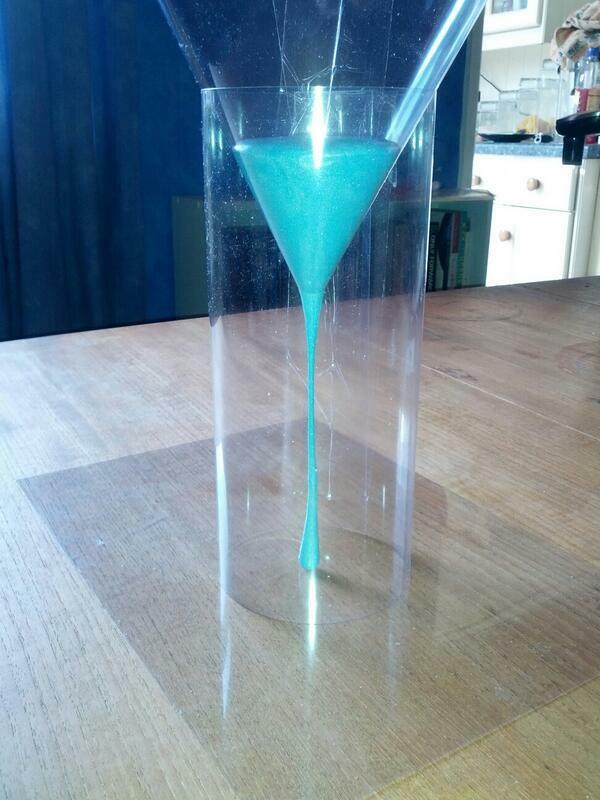 Non-Newtonian fluids in extensional flow are going to be that much worse. However, since we are just making qualitative observations here, we still can get some great insights into rheology despite this uncontrolled variable. 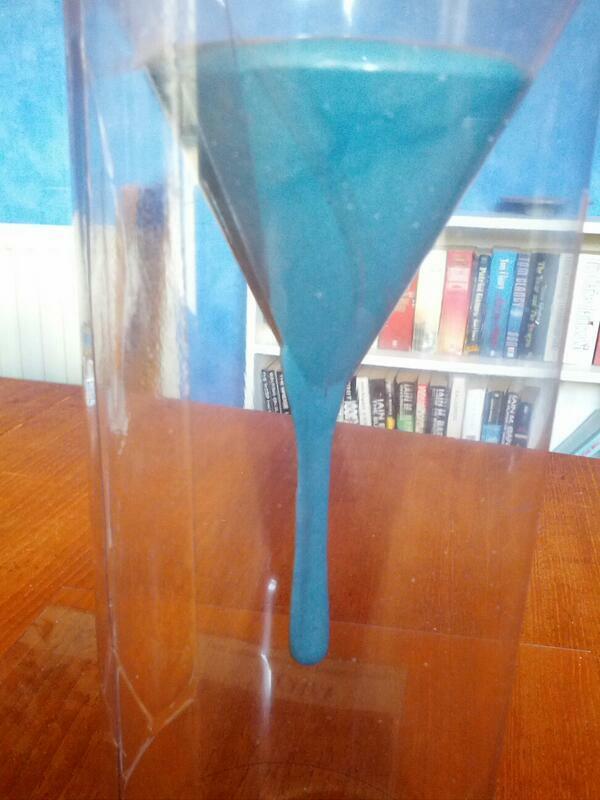 Picture 4 shows an highly elongated "drop" which occurred by "sudden stretching". Notice how the drop is thickest at the bottom and thinnest at the top. The material is under the greatest stress just below the outlet as it has all of rest of the drop pulling down on it. The stress is lessened by the elongation of the Silly Putty. As the elongation develops, the silicone chains are able to more easily slide past one another, allowing for the "sudden stretching". Picture 5 shows the drop "falling over". This is because the inertia of the fluid below the outlet is forcing it downward, but the bottom of the drop has stopped moving. The drop is no longer being pulled apart, but instead is being pushed together. Just like pushing a rope, it bends rather than compress. Picture 6 shows the "drop" continuing to fall, but it is getting thinner and thinner. Eventually it becomes too thin and breaks entirely as you see in Picture 7. Picture 8 is quite a bit later after several drops have fallen. Notice how you can still make out their existence at the bottom. 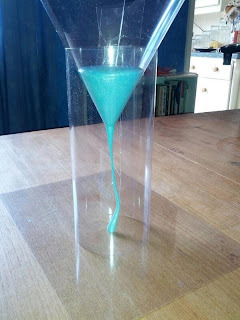 So while the Silly Putty in the funnel is acting like a fluid, the material at the bottom is acting much more like a solid and not flowing back together. There is simply not enough mass and/or shear present to stress the putty enough to cause it to flow quickly. 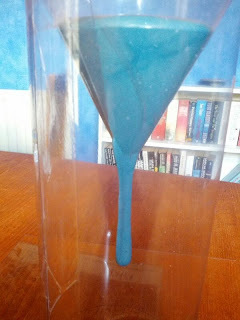 Experiments such as these are a gobbled-up mix of shear, elongation, surface tension and other forces at work, all being influenced at different rates. You should see some similarities with the Pitch Drop experiments, but as the geometries of the funnels and the rheology of the materials are different, there is not an exact 1-to-1 correspondence. At my previous position at an a contract R & D company, I always love to hear a client say "Oh, we tried that and it didn't work". What it usually means is that they tried some small subset of "that" and it didn't work, such as, "we tried polyethylene and it didn't work". Which polyethylene? High density? Low density? Linear low density? Ultrahigh molecular weight? Crosslinked? Ethylene copolymers? Filled? As you can see, there are plenty of possibilities even for something as restricted as polyethylene, and it is pretty unlikely that someone tried them all. "Polyurethane hot-melt adhesives have become a standard for applications bonding wood to other substrates, including wood, metal and composite materials. Many of the desirable properties of such adhesives lie not in the base polyurethane but derive from an increasingly complex array of additives that tailor performance to the exact bonding needs. Large numbers of custom providers, each touting their unique advantages, supply such adhesives. Finding reduced cost adhesives that meet growing performance expectations is a complex and never-ending pursuit." The RFP has a list of technical requirements, but also clearly states that no polyurethanes need apply. As if they have looked at all the possibilities out there. Wow. To exclude such an expansive and versatile set of chemistries, for no other reason than "we tried it and it didn't work" is mind-boggling. There are plenty of legitimate reasons for excluding polyurethanes, such as the isocyanates or cost or their lack-of-greeness, etc., but "we tried it and it didn't work" is not one of them. Solving technical problems is hard enough; arbitrarily excluding a set of solutions only makes it that much harder. [*] Not really. It's not that I disagreed with their vast range of properties and their versatility; I just didn't think that other polymers that are just as versatile got the credit they deserved. 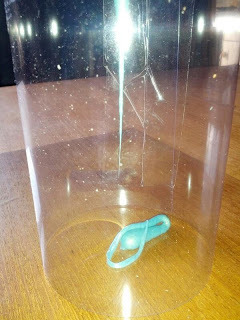 Back in June, I wrote about using plastics as radiation shielding on spacecraft, and even had a followup on correspondence with the author regarding the degradation of the polymer over time. I promised to get myself to the library [*] sometime to look up tabulated data on the matter that I knew existed in the Polymer Handbook, a book located in the reference section of the library. The Polymer Handbook has a chapter in Section II about the Radiation Chemical Yields of polymers exposed to radiation. What I like the most about the chapter is that it has columns for both the crosslinking yields and scissioning yields, often for the same polymer. That's right; when exposed to radiation, polymers do not just crosslink or just get degraded, but both reactions occur. It's just that one reaction tends to dominate, a concept that is lost on too many people (as we will see shortly). As was previously reported, the A-150 Tissue Equivalent Plastic is a blend of polyethylene and nylon 66 with some fillers. The tabulated data showed that the crosslinking reaction for polyethylene dominates the scissioning reaction, but sadly, the book is silent on nylon, or at least aliphatic nylon. I was able to locate a reference on the radiation of nylon which states: "Polyamides crosslink and lose crystallinity upon irradiation causing a slow increase in tensile strength but a much more rapid drop in impact strength. The latter characteristic falls to half its initial value after a dose of about 20 Mrad." Notice how that the author falls for the false choice of crosslink/scission? So it appears that the A-150 will undergo mostly crosslinking reactions in space, resulting in a increasingly brittle material. That is still preferable to the other option of chain scissioning which would only weaken the material over time. [*] What's a library you ask? Well, it's this building that has shelves filled with these old information and storage media called "books". Books were made by chopping down trees and using the cellulose in them to make flat sheets of material called paper. The paper could be marked with a colored liquid called ink. If the ink formed patterns similar to those generated by the pixels on your IPhone or IPad, people could read them. The only problem is that the marks were more or less permanent and so each book had a fixed set of information in it. Stop laughing! I'm not making this up. This is how people use to get information. Last week, the big BPAphobic issue was the announcement that BPA harms the fertility of human eggs. As usual, the hyped-up PR blurb from the researchers organization got all the press and was repeated ad infinitum while the actual research article was unread even though the article was open access. And that goes for the summary too. "LIMITATIONS, REASONS FOR CAUTION Although we used sibling oocytes to overcome potential confounders, such as infertility diagnosis and maternal age, additional studies with a larger number of oocytes are required to confirm the present results. Having access only to clinically discarded oocytes, we were limited to evaluating only those oocytes that failed to mature in vivo despite having been exposed to gonadotrophin stimulation and the ovulatory trigger of HCG." In otherwords, they had a batch of bad, or at least dubious eggs to start with. Reading the article would surely produce more questions about the conclusions, such as whether or not the BPA doses were reasonable or not, etc. but somehow these limitations that the authors themselves point out were overlooked, despite them being readily available on the summary page. When we last left Dow Chemical, they had just been hit with a $1.2 billion price fixing fine. While the jury-decision against them and the fine is undoubtedly being appealed, they have already made a slight headway in getting it reduced. The judge in the case has reduced the fine by $139 million, the amount paid by the other defendants in the original class-action suit. (You may recall that the other defendants settled out of court, something that Dow certainly wishes it had likewise done.) So now Dow only owes $1.1 billion, instead of $1.2 billion. Considering that that $1.1 billion is nearly half of Dow's operating income for the year, every little bit counts.